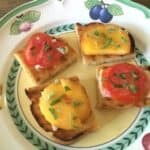 I can’t get enough of these grilled toasts layered with peaches, mint, and cheese. My whole family is gobbling them up. These toasts are inspired by similar ones at Superba Snack Bar in Venice, CA on Rose Avenue. The whole area has an up and coming, hip, casual, neighborhood vibe. My husband and I had a fun night sitting on the patio chatting with a neighboring table as we were served one delicious small plate after another. I came home remembering the peach toasts, and decided to make my own version. Lately I have been on the hunt for the Los Angeles food truck with the best banh mi sandwich, a Vietnamese sandwich that features French bread, sweet pickled vegetables, cilantro, and a protein such as chicken or tofu. So far I haven’t found my dream sandwich on a truck, so I’m happy I found this sensational recipe for banh mi in The Great Pepper Cookbook by Melissa’s Produce. This brussels sprouts salad is my new “go-to” salad. 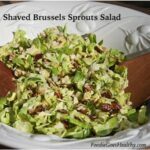 The shaved sprouts have a great crunch and are a welcome change from a salad with regular lettuce. Shaved, raw brussels sprouts are similar to the cabbage in coleslaw rather than like cooked brussels sprouts. I’m enjoying this salad and like the variety it’s adding to my cooking repertoire. 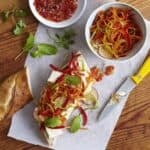 Best of all, this salad is ideal for entertaining because it can be made days ahead (with the dressing on the side) and can sit out on a food buffet without getting soggy. 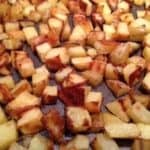 Gemma’s potatoes are soft on the inside and crunchy on the outside. 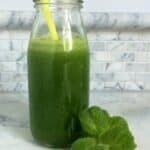 It’s a simple recipe that satisfies my need for crunchy foods. With potatoes this good, who needs deep fried foods? I make similar potatoes, but Gemma’s are a notch better because they are crispier.